Ouattara began by referring to the precedent of Radio Mille Collines in Rwanda, saying that Aboa “called on hate, hatred.” Video here, from Minute 13:56. But press freedom experts have rejected this analogy, after viewing RTI footage like this. Ouattara went on to say Aboa got money from Gbagbo “to buy arms, to distribute arms to mercenaries.” Then why focus on Aboa's speech? Inner City Press asked about the FRCI, under Guillaume Soro, taking over pro-Gbagbo media organizations in Abidjan, and also reportedly shaking down miners and others. Ouattara said Soro's Forces Nouvelles are being “merged” with “Mister Gbagbo's Army” and that commanders will be held responsible. So what about Douekoue? Inner City Press asked the spokesman for UN Secretary General Ban Ki-moon, who met with Ouattara on Wednesday morning, if as requested he had raise the case of Hermann Aboa. Spokesman Martin Nesirky said he didn't know, even if the request had been received. We will continue on this. Update of 3:20 pm - Ban's acting deputy spokesman Farhan Haq has just "squawked" that Ban "was made aware" of the letter about Hermann Aboa and press freedom. But still not answered: did Ban raise the issues to Ouattara? There's only a read out that doesn't mention the issue, click here to view. Choi had previously said he would stay through the parliamentary elections, but that seems to no longer hold. Inner City Press asked about these; Choi said they were slated for the end of the year but face a number of challenges, including looted electoral offices and consideration of adding 50 to 75 seats. Inner City Press asked Choi about the the continued “house arrest” of Laurent Gbagbo: does the UN think that he should be charged? Choi described his visit to Gbagbo, including Gbagbo jokingly asking his doctor if he's healthy, but did not opine on detention without charge. Pressed, Choi said that there are processes underway at the International Criminal Court and in Cote d'Ivoire, but they are in “preliminary” stages. So much for the UN and habeus corpus. 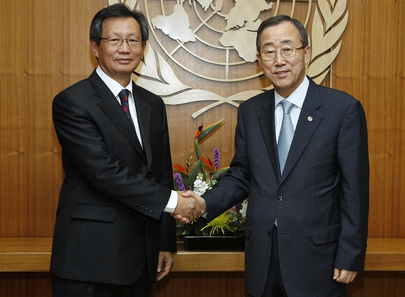 Choi & Ban Ki-moon: hello, now goodbye? Nor has action been taking on the killings in Douekoue, which Choi said were “two thirds” committed by forces supporting Ouattara. Inner City Press asked Choi what has been done and he described meeting with Ouattara, who in turn called in the prime minister and zone commanders and promised no impunity. We'll see. Footnote: as Choi left the Security Council stakeout, Inner City Press joked to him that since Ban Ki-moon ran for a second term without any alternative candidate, he hadn't needed anyone to run his campaign as Choi did in 2006. Choi and his two aides laughed and then were gone. Inner City Press asked the Korea Broadcasting crew, thinking they might have insight into Choi's next assignment, in Seoul or for the UN, "what do you think he'll be doing next?" One said, "Having lunch." The French were monitoring, to say the least, plans for a coup d'etat against Gbagbo, that would result in Gbagbo's “displacement” outside of Cote d'Ivoire. See document here. France's internal reporting on military forces and leaders in Cote d'Ivoire is here. Also obtained by Inner City Press is the French analysis of the “failure” of African leaders Tandja, Mbeki of South Africa and Obasanjo of Nigeria -- later given UN mandates and pay elsewhere. Click here and here for French analyses of the three heres, and here again for a French memo on the intentions of Guillaume Soro, referring to another childhood friend of Gbagbo and his “ethnie Bete” -- Bete ethnicity. After Inner City Press' publication on April 8 of the first installment in this series, which endeavors to use primary documents as background to recent action in Cote d'Ivoire -- as well as to question why a French diplomat, Romain Serman, arrested in New York for attempt purchase of cocaine and resisting arrest, has resurfaced as France's general consul in San Francisco -- Yousoufou Bamba, who has represented the forces of Alassane Ouattara at the UN for months, called Inner City Press. Bamba, who has always been amiable and on the record, complained he thought Inner City Press is “being used,” adding that in Ivory Coast, these French documents are seen as helping Gbagbo. But question then the contents of the documents. as quickly as possible, whether the US was informed / aware of French diplomat Romain Serman's arrest in New York in 2006 for attempted purchase of cocaine and resisting arrest before Serman re-appeared in the US as France's current general consul in San Francisco. Separately, please comment on the applicability of US law and precedent to this case, l'affaire Serman. This is something the US State Department should be able to answer. Watch this site.